The Gym Dandy is 121.4 KB. Larger files take longer to load. This is the Gym Dandy listing page, here you can download the plan, article and see the main thumbnail and extra images. INDOOR R/C flying has always been a tantalizing thought. You know - sitting in your living room, with a little six inch job buzzing around at your command. Maybe we'll see it one day - in fact, we probably will, in some modified form not in existence. Meanwhile, we have to settle for what is currently available. And it's not too bad, either. Several years ago I published a design, called 'Warpy' (for obvious reasons) which was reasonably successful for that time. Since then, the .010 engine has been developed, transistorized receivers have improved, and most important, Hobby Poxy came into being. Why is Hobby Poxy most important? Simply because the structure of an indoor model must be very light, and therefore fragile. This is no prob-lem with a rubber powered job, but glow fuel requires that the model cov-ering be fuel proof. If you use dope, it pulls the model all out of shape (that's how Warpy got its name), but with Hobby Poxy you can make the structure as light as the air loads will require, since the application of Hobby Poxy won't shrink the tissue and subsequently warp the structure. Next, the .010 was a big step. The only problem is, it's too powerful, so you have to tame it down with an inefficient prop. Finally, the small 'Minitron' compound escapement by O.S. eliminates the sequence operation required by the simple "bing-bang" escapement. My prototype of the design shown here has a Bonner SN, and I have to admit that too often I would "bing" when I should have "banged," so a "Minitron" com-pound escapement has been utilized to solve that problem. Well, you still can't fly this design in your living room, but it's a real dandy for flying in a gymnasium - a Gym Dandy, in fact. So, build one up and get permission from the school principal to use the gym during some unscheduled periods. 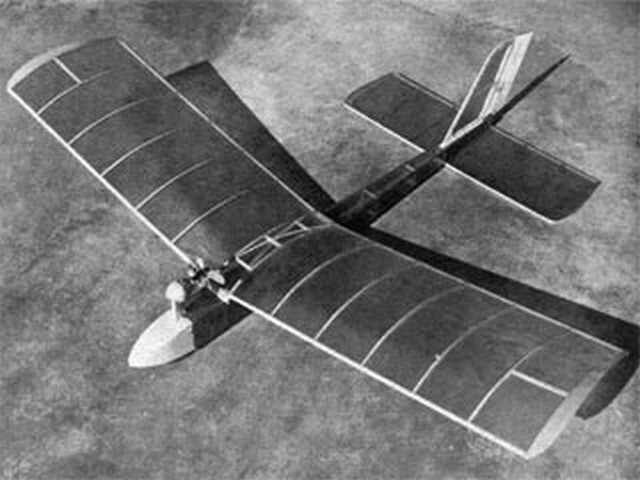 Light weight is essential to keep the flying speed down - the prototype weighed in at four ounces! You should try to match this, because it gives a flying speed of about five to six miles per hour, and at that speed, even if the model hits anything, the only damage is to the model itself, which is easily repairable. The engine is a pylon mounted pusher configuration. Thus it won't be likely to get the prop entangled with any obstacles in case the model does hit something. The relatively high dihedral and huge rudder area makes it possible to rack the model around in tight circles without immediately spiralling down. No landing gear is necessary. You hand launch, and with a little practice, you'll find you can fly it right to you and catch it in midair at the end of the flight. The structure is a straightforward box, spar, and tissue framework just like old time rubber models. The tissue should be ironed before applying so that it's pretty smooth (let it cool an hour or so after ironing so it's at room temperature when you attach it to the framework). The construction notes on the plans show all the required sizes of balsa; we don't have to go into it in any more detail, since it's self explanatory. Note the 'half size' pencells for receiver drain is small, and the O.S. escapement has a unique 'by-pass' feature that cuts the power requirement way down after the initial 'pull-in' power has been applied. Perhaps your biggest problem will be matching the .010 power to your plane. To do this, you need a very inefficient prop - otherwise the Gym Dandy will beat itself to pieces on the ceiling! I've shown a block from which you can carve a pusher prop, but you'll have to make a real 'club' blade in order to keep the thrust down. As a control device I've also shown a 'thrust reverser.' This is a little metal stub propeller with the blades twisted opposite to the main prop, thus counteracting the thrust. You can vary it by the amount of twist - even to the point of reducing the thrust to practically zero, even tho the engine is screaming. The amount of reverse thrust will depend on your particular plane, prop and engine combination. A couple of test flights will suffice for determining the necessary amount. Even if you don't have a gym available, you can amaze your friends with this lumbering model by flying it outdoors on windless days. No matter where you fly it, you'll get a kick out of it. So build a Gym Dandy, just for the novelty. You'll be glad you did! These are the details for the "Gym Dandy" plan. If you would like to become a plan editor and help us to edit the attributes of all the plans in the website please click the "Edit Attributes" button below. Keywords: Indoor monochannel .010 stick construction vintage. Order your Gym Dandy prints today! The Gym Dandy plan can be printed on plain paper, tracing paper or polyester film and shipped worldwide. This tool allows you to calculate the cost of printing and shipping the Gym Dandy plans and its building article if available. 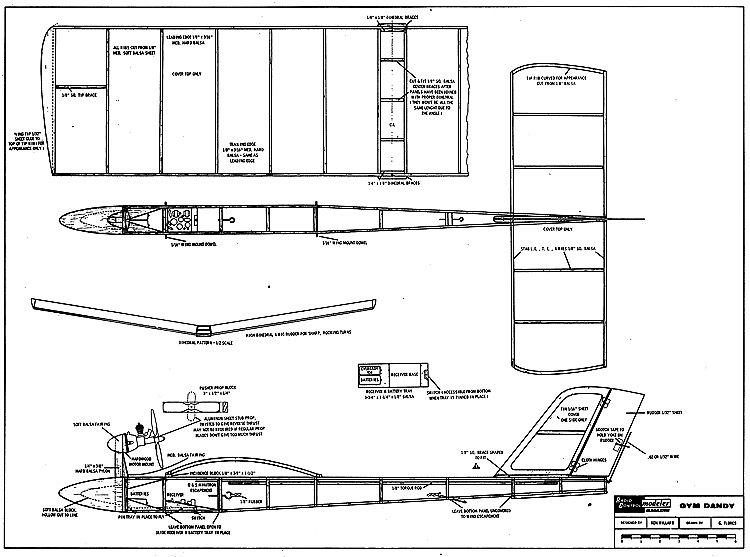 If you need to resize a plan please contact us with the ID:97976 and the desired wingspan. I will calculate a price upon request, please contact me here mentioning this PlanID: 97976 and the job you wish me to do. This plan is 121.4 KB and was shared by our member André on 13/01/2017 16:15 in the PDF Bitmap Wood Model Airplane Plans (2) category.